The post of Parliamentary Secretary has been dissolved and now no ” more ” parliamentary secretaries ” in Arunachal Pradesh- read this report. The government of Arunachal Pradesh while complying with the Gauhati High Court, Itanagar Permanent Bench, Order dated 25.07. 2018 passed in the P1L No. 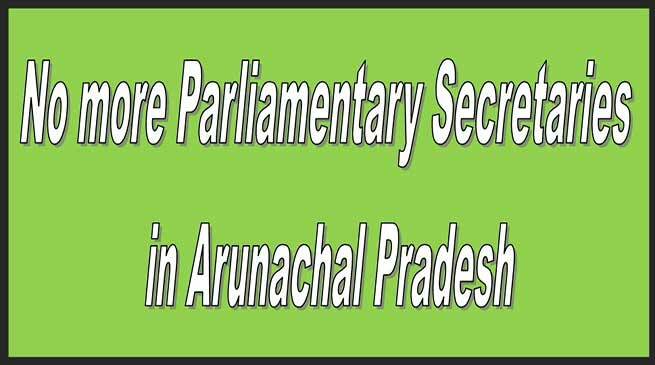 22(AP)/ 2016 (Shri Khyoda Ram Vs. State of Arunachal Pradesh & 36 Others) declaring the Arunachal Pradesh Parliamentary Secretaries (Appointment. Salaries. Allowances and Miscellaneous Provision) Act, 2007 as ‘unconstitutional’, the Governor of Arunachal Pradesh is pleased to order that the following Members of Legislative Assembly, shall cease to be Parliamentary Secretaries:. The order to this effect was made vide government order No- No. Pari/Aff – 64/2007, dated Itanagar, the 13″1 August 2018 signed and issued by Commissioner (Parliamentary Affairs) Bilatee Pertin today. When contacted Commissioner Pertin said that government of Arunachal Pradesh have acted as per the direction of the High Court order and the order have been passed and there shall be no more parliamentary secretary in state. he said that the order will be effective forthwith retrospectively from the date of pronouncement of the judgement ie, July 25 2018 by the High Court. The MLA who lose their post of Parliamentary Secretary are Chow Tewa Mein, Punji Mara, Phosuni Khimhun, Thangwang Wangham, Gojen Gadi, Phurpa Tsering, Jambey Tashi, Pasang Dorjee Sona, Likha Saaya, Gum Tayeng, Tapuk Taku, Kumsi Sidisow, Karya Bagang, Techi Kaso, Mama Natung, Tatung Jamoh, Nyamar Karbak, Zingnu Namchoom, Kaling Moyong, Tesam Pongte, Laisam Simai, Tage Taki and Tamar Murtem.